The Dark Ranger: Sheldon Souray a Blueshirt? TDR comments: Obviously, this is the kind of news we've been looking for all season -- that is, if it were to happen. It's refreshing to know that Slats and Co. are attempting to improve the team. Our weak at the knees blueline has not only tested the limits of elite goalkeeper Henrik Lundqvist, but have downright fallen apart when you least expect it. 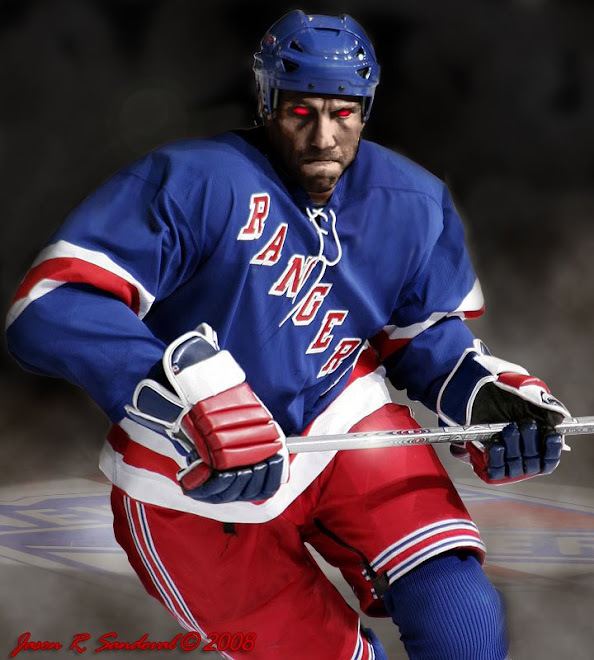 Sheldon Souray wearing Ranger's Blue would support the up-and-coming talents in Marc Staal, Dan Girardi, Michael Del Zotto and Matt Gilroy - adding a higher caliber veteran presence in the locker-room, other than the overpaid and underachieving Wade Redden and Michal Roszival. It all sounds too good to be true. Additionally, given Souray's family resides in southern California, it is unlikely that he'll pack it all up and move East. On a side, check out Souray's ex-wife Angelica Bridges head shot. What pretty eyes you must be thinking? Souray and Bridges separated last year. Maybe she is the reason why Souray's season has been out-of-whack and a trade is possible!! ?